One of our best-sellers at last September’s IBM British Ring Convention at Southport was John Gray’s Coin Craft DVD, which comes complete with his ingenious Poppit gimmick. We have received new stocks and these are now available again ‘off the shelf’. Until his retirement John was a busy professional magician working top night clubs and cruises throughout Europe and the USA. So you would expect his material to be practical and commercial. John developed the Poppit a few years ago for vanishing and switching small objects, especially coins. 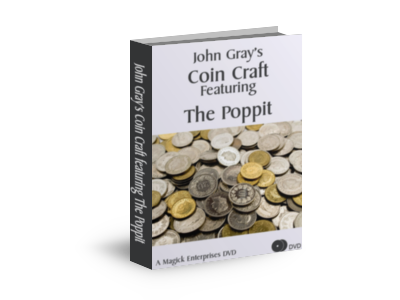 Until the release of the Coin Craft DVD the Poppit was known and used by very few of John’s working magician friends. The Poppit is a cunning and versatile device which has the power to transform your coin magic. It is as useful as a Topit but you don’t have to wear a jacket, a tie, or a sleeved shirt. Or any shirt, for that matter! The DVD shows in detail two complete routines, incorporating a series of surprising and entertaining effects: The One-Coin Wonder and The Really Weird Coin Trick. These show the Poppit in action. The components of these routines may be simply adapted and re-combined to suit your own requirements. There are no ‘knuckle-busting’ moves, and many of the techniques required have been honed and adapted by John Gray to suit modern working conditions. A further section on the DVD covers in detail not just the basic Poppit, but also the Extended Poppit (which allows you to easily and naturally retrieve vanished coins); and Poppit Plusses. A Bonus Section deals with further applications for this great little gimmick: Tunnel Vanish, Retention Vanish, Multiple Coin Vanishes, Vanishing One Coin from Several, Copper Silver, and Spellbound. Drop us an email if you’d like more details. I can vouch for the author’s skills in magic tricks, I worked with him on cruise ships in the ’80s. Bought this last sept , i have learnt so much from it, a great DVD to have refine your magic , Looking forward to more DVD’S from this magician. I have seen John Gray at a number of corporate events in the States. Great magic and a pleasant guy. I am not a magician, so haven’t seen this disc, but I can certainly recommend his magic. If this disc explains it, you guys should grab it!